Atlante is a tactical long-endurance unmanned air vehicle (UAV) system designed by Spanish company MAS principally for the Spanish Army to perform intelligence, surveillance, target acquisition and reconnaissance (ISTAR) operations. Other operations carried out by the UAV include identifying target, day and night surveillance, over-the-hill reconnaissance, battle-damage assessment, troop and convoy protection, border surveillance, drug-trafficking control, and search and rescue. The UAV will also meet the requirements of the homeland security department, Guardia Civil and other Spanish emergency agencies. 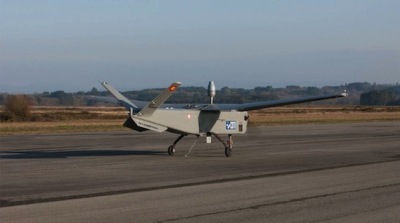 The UAV system will be manufactured by EADS CASA. It will offer fully automated take-off and landing capabilities, even in adverse weather conditions. The Atlante UAV will provide its operators with real-time information on the enemy's battlefield by performing surveillance and target acquisition over a large area. Atlante will perform cost and maritime surveillance,target localisation and route reconnaissance. The unmanned aerial system (UAS) of the UAV will comprise four or more vehicles, a ground-control station, a transport, launch and recovery unit, and a maintenance unit. The design of the UAV will offer the capability of operating 24-hours a day in any meteorological condition. The UAV does not require take-off or landing strips, although it is provided with a landing gear system designed to operate from unprepared runways. It can operate in two modes, namely landing and take-off from runways, and can take-off from the launcher and retrieval from a parachute. In December 2009, the Centre for the Development of Industrial Technology (CDTI) approved the Atlante UAV project. The UAV will be developed as part of the 2007-2012 Aeronautics Strategic Plan (ASP) of the Spanish Ministry of Industry. CDTI is financing the development of the project. The UAV will be configured to carry out multiple operations even in adverse weather conditions. It will employ multiple sensors and radars for extended-range data capture and transfer. It will also feature a FCC, designed and developed by the GMV, for navigation, guidance and control of the aircraft. The FCC will comprise on-board sensors for navigation, an automatic take-off and landing (ATOL) system, actuators and a global positioning system (GPS). It will organise the automatic take-off and landing from the ground station using GPS-based navigation algorithms integrated in the navigation filter. The Atlante can be controlled either manually from the ground control station (GCS) or through an autonomous mode using an automatic launch and recovery (ALR) system. The UAV will land safely in spite of communication error in the GCS. The Atlante UAV will be equipped with electro-optic (EO) and infrared (IR) sensors, and a laser designator. The EO sensor will convert light rays into electronic signals for capturing images, real-time data and videos, while the laser designator targets the enemy's battlefield. The UAV will be equipped with a synthetic aperture radar (SAR), intelligent and lightweight payload, and aeronautic predictive maintenance intelligent system. The range and service ceiling of the aircraft is 400km and 20,000ft (6,096m) respectively. The maximum endurance is 20h. The UAV's maximum take-off is 520kg and it can carry a maximum payload of 100kg. The GCS of the Atlante UAV will be manufactured by EADS CASA. The data retrieved and transmitted by the UAV will be stored at the GCS. The control station will feature a ground data terminal, a remote video terminal and a flight line tester / loader. An air data computer in the GCS will display the UAV's position. Programa Nacional de Observación de la Tierra por Satélite. Programme National d'Observation de la Terre par Satellite. Jette un coup d'oeil à ce link.. The idea of a nanosatellite has absolutely nothing to do with nanotechnology, a term that refers the precise engineering of materials on atomic and molecular scales. From a nanoscale perspective, a 5-kg satellite looks like Mt. Everest. Nanosatellites are appealing because their small size makes them affordable and opens up the potential for a swarm of the satellites. They can piggyback on larger launches, avoiding the need for a dedicated launch. From a military perspective, a nanosatellite may be useful for the redundancy it could offer. Its small size might also help it avoid detection. PS:Le Nanosat 1B par son poids et selon la clasification serait plus un microsatellite qu'un nanosatellite..
Indra will implement its electronic defence systems in two new U212 submarines to be acquired by the Italian Navy after signing an agreement with Fincantieri - Cantieri Navali Italiani. The system will allow this traditional submarine, which is one of the most noiseless and hard to detect, to notice any active radar within a certain range. The analysis capacity of the system enables detection of nearly 100% of the signals, not only the weakest but also those with low probability of detection. The solution will also facilitate followup of the signal transmitter and identification. The analysis of the radio electric spectrum takes place in real time which offers an advantage for the submarine crew over other platforms. This is possible thanks to the high information processing capacity of the system and its intelligence since it is capable of recognising the electronic finger print which distinguishes radar types. Besides this, it offers the possibility to record all the data for further analysis. Another distinguishing feature of the solution is its high integration capacity with other systems, either command and control systems and communications or with other transmitters embarked on the U212. One of the key aspects which made this contract possible was the successful implementation of the system for the German Navy's U212. In addition to this, the solution meets NATO requirements for international missions. All this offers a significant advantage over competitors and has granted Indra this important international reference. The company is also broadly experienced in the sector of electronic defence and is the supplier of this type of systems for the Spanish fleet. The system has been implemented in the new F100 frigates, the Strategic Projection ship or the future S80 submarines. Indra's equipment is also present in cutting edge platforms such as Eurofighter or the A400M, among others. Indra is the premier Information Technology company in Spain and a leading IT multinational in Europe and Latin America. It is ranked as the first European company in its sector according to investment in R&D and is the second Spanish company in absolute value investments in R&D. In 2009 revenues reached € 2,513 M of which a 40% came from the international market. The company employs more than 29,000 professionals and has clients in more than 100 countries. 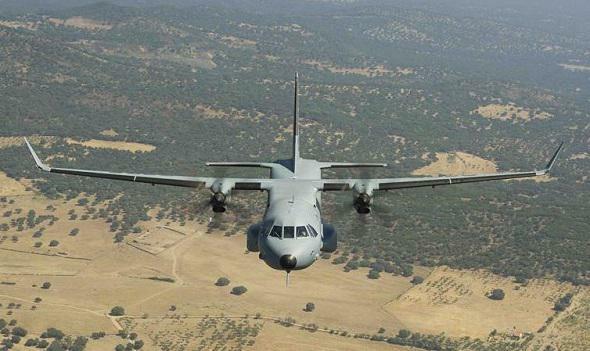 Airbus Military has delivered the last C212-400 assembled in Spain. This delivery marks a moment of Spanish aviation history and the end of more than 40 years of continuous production of the C212 –one of the Spanish best-known aerospace products– at the Airbus Military final assembly line (FAL) in Seville, Spain. Since its maiden flight in 1971, 477 C212 have been built for 92 different operators. Nowadays, 290 C212 remain in service in 40 countries all over the world. The three countries in which there are today most C212s in operation are Indonesia (70 aircraft), USA (37), and Spain (26). This 477th C212 –the third and final C212-400 for the Vietnam Marine Police– was formally delivered on December 28th, ending 42 years of continuous production of the type. Designed in the late 1960s, the C212 was first delivered to the Portuguese Air Force and the Spanish Air Force in October 1974. After its entry in service, the airlifter became rapidly renowned at a global level for its robustness and reliability. In fact, the C212 has been successfully operated in every corner of the planet –including the Antarctic ice cap. Operators in some of the toughest operating conditions to be found developed enormous affection for its uniquely versatile characteristics and deployed it on an extraordinary variety of roles ranging from transport to rain-making, ultra-sophisticated surveillance to search and rescue. The Design Office of the company eventually developed four different series of the aircraft – culminating in the C212-400, which made its first flight in 1997, in addition to a variety of special mission versions. Airbus Military CEO, Domingo Ureña-Raso, said: "Every Airbus Military employee involved with the C212 throughout these years can be rightly proud of producing an aircraft that has served its operators faithfully over many years and provided the basis for the development of CASA into the world-class company that it is today in the form of Airbus Military. Times move on, but it will be a great pleasure to see the C212 continuing to fly in near or far-flung corners of the globe for many years to come." Both military and civil operators have benefited from the C212´s versatility and reliability throughout four decades. From now on operators from all over the world will have a new and upgraded version available, renamed as NC212, that will be produced jointly by PT Dirgantara Indonesia and Airbus Military and assembled in Bandung (Indonesia). The Airbus Military final assembly line in Seville will now focus on the production of the C295 and CN235 aircraft in both transport and mission configurations, as well as on the increasing activity on the A400M assembly line. The outstanding reliability demonstrated by more than three million flight hours makes the C212 the most successful aircraft in the light transport segment for the most varied types of operations. With a maximum payload of 2.8 tonnes, it was designed to operate in austere environments for long periods of time. Its robustness allows it an absolutely reliable operation in the desert, the jungle o the Antarctic. Its unique STOL performance with low-pressure tires allows unrestricted operations on soft and unpaved fields in hot and high altitude conditions. The excellent handling qualities and its fast engine response enable the highest level of manoeuvrability at very low altitudes. The C212’s simple design and maintenance reduce the life cycle costs to the lowest level in its segment. The upgraded version, the NC212, launched in November 2012, will be equipped with new digital avionics and autopilot systems and will have a new civil interior for up to 28 passengers, increasing its cost efficiency significantly. This upgrade will keep the NC212 in the light aircraft market as an even more competitive product. Airbus Military is the only military and civic/humanitarian transport aircraft manufacturer to develop, produce, sell and provide support and services for a comprehensive family of airlifters with a payload range of three to 45 tonnes. An Airbus subsidiary, Airbus Military is responsible for the A400M programme, the A330 Multi Role Tanker Transport (MRTT) and further military derivatives based on Airbus civil aircraft. These, together with the smaller 'Light & Medium' C295, CN235 and C212, make Airbus Military the global leader in the market for military transport, tanker and surveillance aircraft capable of performing the most varied types of missions. Altogether, Airbus Military has sold more than 1,000 aircraft to nearly 138 military, civil and governmental customers. More than 800 of these aircraft have been delivered. 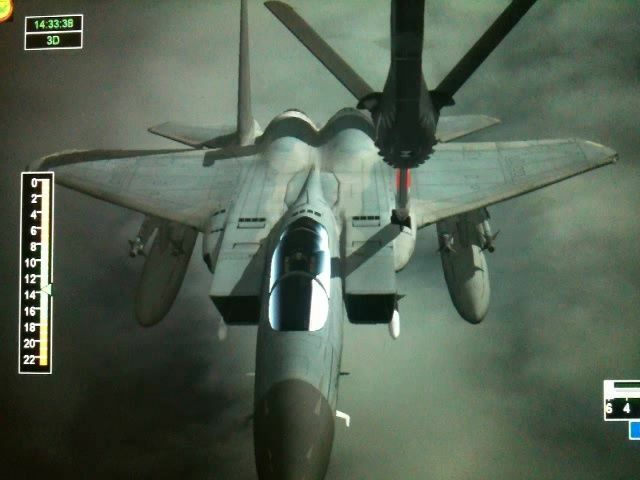 Airbus is an EADS company. MADRID --- Airbus Defense and Space is preparing to return to the UAV market, three years after it was forced out by the reluctance of the French and German governments to financially support any of the unmanned aircraft projects which it had developed. This is a major shift in company policy, as Airbus Group decided in 2011 to freeze its UAV activities after having invested over 500 million euros in several programs without having convinced its domestic customers that they were worth supporting. Corporate strategy, at the time, was to sit out until European governments decided which programs, and which companies, they would support. This approach was not very successful, however, as Airbus was frozen out of two major market segments: Medium Altitude Long Endurance (MALE), where France preferred buying Reaper unmanned aircraft from the United States, with Germany and the Netherlands to follow shortly, and the High Altitude Lone Endurance (HALE) segment, where its EuroHawk program was abruptly cancelled by the Germen government because of cost and regulatory failings. The company was left with only smaller UAVs, a segment where competition is rife and margins small. Airbus has now changed tack because “it’s time for a proper aircraft manufacturer to get involved, to certify UAVs to civilian standards – and I mean FAR 23 and FAR 25 – so they can be used in unsegregated airspace,” Rodriguez said. At present, UAVs can only be used in segregated airspace, under military air regulations, and so are severely limited in their operational usefulness. While it has no immediate plans to resume large-scale investments in the UAV sector, Airbus DS does not see financing as a major obstacle. “We know there is a market, and if there is a market there is money,” Rodriguez said. He adds that for Airbus this is a decade-long project, which will eventually bring it a leading role: “Airbus is not here to be a subcontractor,” he says, making clear that the company is not aiming for a subordinate role in ongoing European UAV programs. While waiting for the MALE market to mature, and for the dust to settle in the combat UAV (UCAV) segment, Airbus is finalizing development of its own tactical UAV, Atlante, which is significantly smaller than the MALE and HALE segments it previously pursued. While its UAV strategy matures, Airbus DS continues to improve its transport aircraft product line. It recently agreed with Indonesian partner IPT Nurtanio, also known as Indonesian Aerospace, to develop a modernized version of the C-212 light twin turboprop transport, and it also is refining the performance of the C-295, its very successful medium twin. Most of the effort is on refining the airframe design, for example by adding wingtip extensions, and on increasing engine power ratings, which together add 1,000 ft. to the aircraft’s ceiling in One Engine Inoperative (OEI) conditions. The C295’s Pratt & Whitney engines are already at their power limit, so they have no more growth potential, so these refinements, together with a major upgrade of the aircraft’s avionics, will suffice to keep them competitive for years to come, says Rodriguez. The avionics upgrade will make it easier for the aircraft to operate in a civil environment. A new design may well be necessary in 10 or 15 years, he adds, but for now it is still very premature. The current line-up is quite profitable for the company, and currently accounts for average sales of about 20 aircraft per year, worth about 700-800 million euros including 100-150 million euros for related services. The company has declined to give details of the final client or the numbers or value of the units ordered for this initial sale. However, a company spokesman at the HomSec security technology trade fair in Madrid confirmed the first batch has been delivered to a "Middle East customer". The package includes the company's Techfire fire support system and the Shepherd-MIL reconnaissance unmanned aerial vehicle (UAV), which can be adapted to resemble any type of local bird of prey. Le lundi 26 octobre à Séville, Airbus Defence & Space (DS) a présenté devant la presse internationale ses principaux programmes d'innovation. Parmi ceux-ci, un système automatique destiné à la perche centrale (Boom) des ravitailleurs en vol. Ce système doit permettre, grâce à une reconnaissance optique, au boom de se diriger automatiquement vers le réceptacle d'un appareil au cours d'un ravitaillement rigide (Employé par les chasseurs de l'US Air Force : F-16, F-15, F-22, F-35 mais aussi Awacs). Selon Airbus DS ce système devrait permettre de réaliser des gains de temps et de réduire les risques. Le système automatique devant être plus efficace qu'un opérateur humain. Pour l'heure Airbus DS a conduit une étude de faisabilité du système et a réalisé des simulations informatiques. La prochaine étape, qui pourrait avoir lieu en 2016, sera l'intégration d'un prototype grandeur nature à bord d'un appareil d'essai A310. En parallèle, Airbus DS a annoncé le développement d'un kit de ravitaillement en vol pour hélicoptères qui pourra être intégré sur les avions de transport C295 et CN235. Des essais ont déjà eu lieu pour confirmer la capacité d'approche d'un hélicoptère derrière un C295. Le système de déploiement de la manche de ravitaillement a été testé au sol. Des essais en vol du système complet pourraient avoir lieu en 2016 en fonction de la disponibilité des avions d'essai. Une réponse d'Airbus DS au fait que l'A400M ne sera probablement pas doté de cette capacité de ravitaillement des hélicoptères ? En effet les responsables d'Airbus DS ont annoncé que dans la configuration actuelle, le ravitaillement des voilures tournantes par l'A400M est impossible. Le groupe européen va cependant continuer à chercher des solutions. 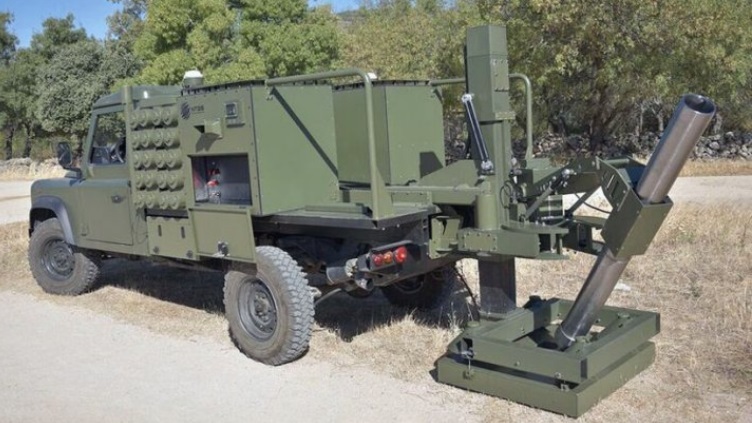 Spain's Everis Aerospace and Defense and New Technologies Global Systems (NTGS) have been awarded their first production contract for the Alakran 120 mm light mortar carrier (LMC). Work on the platform began in 2010 as a private venture with the aim of developing a system that could provide rapid reaction-type units with a highly mobile mortar system than can quickly come into action, conduct a fire mission, and then redeploy before counter-fire can be made. The final development version has the internal company designation of the V4 and following qualification trials in Spain in mid-2015 was tested by an export customer for 12 months. In mid-December 2016 a contract was signed for 100 Alakran 120 mm LMC for an unidentified export customer and these will be integrated onto a Toyota Land Cruiser 70. Production is set to start in the second quarter of 2017 and ramp up to 15 units per month. 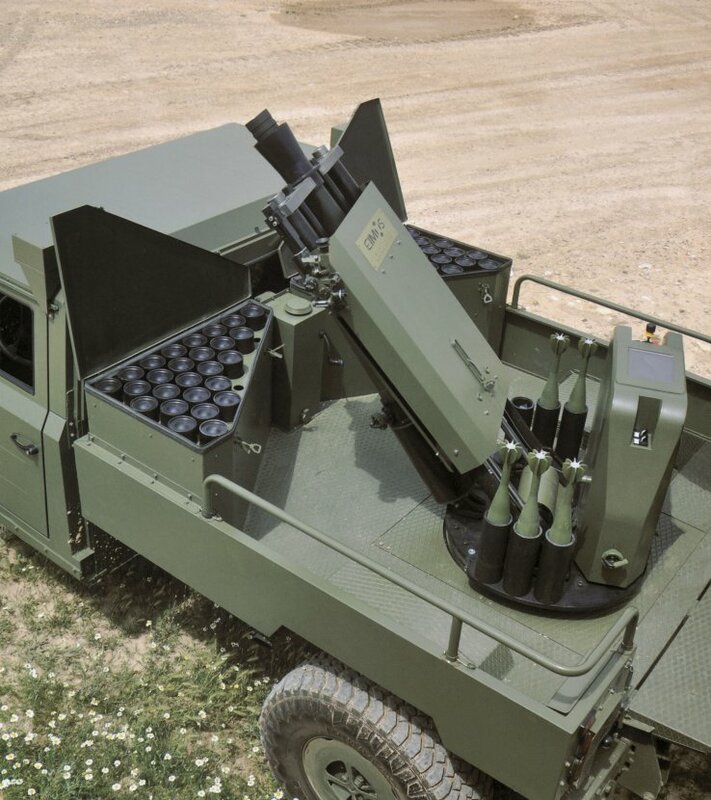 The company has two production-standard 120 mm LMCs - designated the V5 - that are used for trials in Spain and overseas. The system can be integrated onto a wide range of wheeled platforms that have the ability to carry a payload of 1.5 tonnes without any need for structural reinforcements. 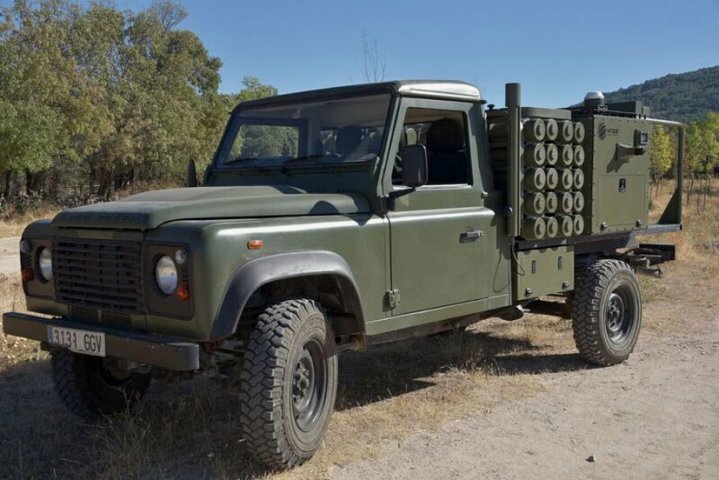 For trial purposes the Alakran 120 mm LMC system has so far been integrated onto a Jeep J8, Land Rover Defender, and the Agrale Marrua. To lay the mortar onto targets an electro-mechanical system is used, with a manual backup in case of power failure. The traverse arc of the mortar is 2,130 mils, while the elevation is from 800 to 1,600 mils. When travelling the mortar is stowed in the horizontal position and when required for action is traversed through the rear until a large square baseplate is in touch with the ground. The platform is fitted with a computerised fire-control system (FCS) that has a flat panel display (FPD) on which potential targets are shown, with this information typically being supplied by a forward observer. L'étroite relation des monarchies espagnole et saoudienne facilitera-t-elle la conclusion d'un juteux contrat de vente de corvettes à Ryad? Cette probabilité provoque l'ire d'ONG dénonçant l'implication de l'Arabie dans des crimes de guerre au Yémen. Felipe VI, 48 ans, entame samedi à Ryad une visite officielle de trois jours, à l'invitation du roi Salmane, 80 ans. Et toute la presse espagnole a déjà fait le lien avec la vente attendue de corvettes de type Avante 2200, pour au moins 2 milliards d'euros. "Nous pouvons seulement confirmer que la négociation est très avancée pour la construction de cinq navires de guerre qui seraient vendus à la Marine saoudienne", dit à l'AFP un porte-parole de l'entreprise publique de construction navale Navantia. Septième pays exportant le plus d'armes conventionnelles, l'Espagne a vu ses ventes à l'étranger augmenter de 55% entre 2006-2010 et 2011-2015, selon le Groupe de recherche et d'information sur la paix et la sécurité (Grip) basé à Bruxelles. Et elle vend de plus en plus à l'Arabie, championne du monde des dépenses militaires par habitant, selon le Grip. Le père de Felipe VI, Juan Carlos 1er, au pouvoir de 1975 à 2014, "avait et a toujours une relation personnelle exceptionnelle avec la famille royale saoudienne, ce qui a beaucoup favorisé les liens économiques", rappelle la journaliste Ana Romero, auteure d'un livre sur la fin de son règne. Il fut le "grand ami" du défunt roi Fahd, qui régna de 1982 à 2005 sur l'Arabie saoudite - première puissance pétrolière mondiale - et reste aujourd'hui proche de son frère, le roi Salmane. C'est Fahd qui offrit à Juan Carlos son premier yacht et tous deux se retrouvaient fréquemment, en privé, en France ou dans le somptueux palais du Saoudien à Marbella - station balnéaire espagnole aujourd'hui encore prisée des Saoud - où Fahd et sa suite dépensèrent 72 millions en un seul séjour en 1999. Juan Carlos fut crédité d'un rôle décisif dans l'attribution fin 2011 à un consortium espagnol d'un contrat à 6,7 milliards d'euros, pour faire circuler des TGV en plein désert saoudien, jusqu'à la Mecque. "Le soupçon a toujours plané que Juan Carlos était un grand lobbyiste non seulement pour l'Espagne mais aussi pour favoriser ses amis, des entrepreneurs proches et peut-être lui-même", explique Ana Romero. Mais "tout est différent avec Felipe VI: personne ne pense qu'il puisse faire quelque chose comme ça, les entrepreneurs espagnols ne voyagent plus avec lui et ses voyages sont beaucoup plus contrôlés par l'Etat". Reste que l'Espagne entend continuer à profiter des "relations personnelles entre familles régnantes", récemment vantées par le gouvernement du conservateur Mariano Rajoy. "Si le contrat des corvettes se concrétisait, cela emploierait plus de 2.000 personnes pendant plusieurs années", estime le syndicaliste de Commissions ouvrières, Jose Antonio Fernandez Vidal à Vigo (nord). "On attend ça comme la pluie en été pour créer de l'emploi dans les chantiers navals" de Galice (nord-est) et d'Andalousie (sud). Mais la prudence reste de mise car les caisses de la monarchie pétrolière sont moins pleines depuis la chute des cours du brut. Et la concurrence est vive. En 2014-2015, l'Espagne a été le quatrième exportateur d'armes vers l'Arabie, derrière les Etats-Unis, le Royaume-Uni et la France, selon l'Institut international de recherche sur la paix de Stockholm (Sipri). La France espère notamment vendre à Ryad un autre type de corvettes, pour sa flotte de la Mer rouge, dit à l'AFP un porte-parole de DCNS, groupe français de construction navale militaire. Quel que soit le vendeur, "la question est: ce contrat est-il légal ou illégal? Or il est clairement illégal", assure Alberto Estevez, expert en vente d'armes pour Amnesty international Espagne. Selon le traité des Nations unies sur le commerce des armes de 2013, aucun Etat ne doit vendre des armes s'il sait qu'elles peuvent servir à des attaques dirigées contre les civils ou d'autres crimes de guerre. Or l'Arabie mène depuis mars 2015 au Yémen une intervention très meurtrière, à la tête d'une coalition de pays arabes soutenant le président Abd Mansour Hadi et combattant les rebelles pro-chiites. Mobilisé depuis un an, un collectif d'ONG en Espagne - dont Amnesty, Oxfam et Greenpeace - a réitéré jeudi son opposition à la vente des corvettes, en évoquant "le risque d'être complices d'atrocités commises au Yémen". "La coalition menée par l'Arabie saoudite a bombardé des écoles, des hôpitaux, des marchés, des mosquées", ont-elles écrit dans un communiqué, dénonçant de "présumés crimes de guerre" et "une catastrophe humanitaire" exacerbée par le blocus des ports du Yémen. La décision prise par le gouvernement allemand de suspendre les livraisons d’armes à destination de l’Arabie Saoudite dans la foulée de l’affaire Khashoggi [du nom de ce journaliste saoudien assassiné en Turquie, ndlr] met plusieurs pays dans l’embarras. Tel est le cas de la France mais surtout du Royaume-Uni, qui n’est pour le moment pas en mesure d’honorer une livraison de 48 avions de combat Eurofighter Typhoon et de missiles air-air Meteor à la Royal Saudi Air Force. A priori, si l’on en croit des informations de l’agence Reuters, le constructeur aéronautique européen entend mettre cette menace à exécution. En effet, plusieurs sources au sein d’Airbus ont confié qu’il est actuellement question de revoir la conception de l’avion de transport militaire C-295, assemblé en Espagne. « Nous sommes en train d’exclure [les composants allemands] de l’avion », a ainsi affirmé l’une d’entre-elles. Vendu à 208 exemplaires [dont 166 sont déjà opérationnels], l’Airbus C-295 [ex-CASA C-295] est avion de transport tactique pouvant se décliner en appareil de patrouille maritime et de guet aérien. Une autre source a indiqué qu’Airbus cherche à voir si d’autres pièces fabriquées en Allemagne sont aussi susceptibles d’être remplacées sur d’autres modèles d’avions. Quoi qu’il en soit, Berlin avait initialement prévu d’imposer le gel des exportations de matériels militaires vers l’Arabie Saoudite jusqu’au 9 mars. Mais il n’est pas exclu qu’il soit prolongé, en raison de la pression exercée par le SPD [Parti social-démocrate], le partenaire de la coalition dirigée par Angela Merkel.